This spoken word message was written by Tony Barrow and was recorded by The Beatles in 1963. It was recorded at EMI Studios and produced by Tony Barrow. It was released as a 7″ flexi disc on the Lyntone label in 1963. It was only available to members of The Beatles’ fan club. The disc features renditions of Good King Wenceslas, God Save The Queen and Rudolph The Red-Nosed Ringo as well as a few notes of From Me To You. An edited version was released in America in 1964. 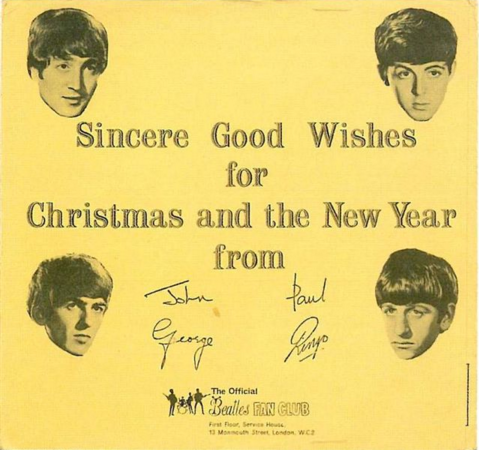 This entry was posted in Beatles and tagged 1963, good king wenceslas, Rudolph The Red-Nosed Ringo, The Beatles, The Beatles Christmas Record by dannyfriar. Bookmark the permalink.